The company that ran the Poll before deleted all of my polls and the archives so unfortunately none of the links work anymore and none of your comments were saved. :-( I'm going to try to see if I saved any of the archived results and I will add them later. This new poll does not let you leave additional comments so if you want to discuss anything about the poll it would be great to have discussions on the message board about them. You can vote as many times as you want. A pop-up screen will appear and give you the results. Have fun voting! Which of these 5 Victor movies is your current favorite? Every woman wanted to marry Victor. If you could have played the female lead character in any of the following Victor movies which would you have chosen and why? 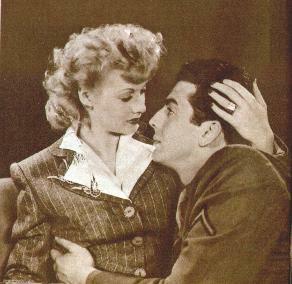 You chose Nettie in "Kiss of Death". Every man wanted to be Victor. If you could have played the role Victor played in the following movies which would you have chosen and why? Which movie would you like to see next in Mature Theater and why? You chose "My Darling Clementine". Which do you consider to be Victor's best comedic performance and why? You chose "After The Fox". Which is your favorite scene in Samson and Delilah and why? Which role would you have liked to have seen Victor play most and why? You chose Rhett Butler in "Gone With The Wind". If you could have spent one day with Victor Mature, how would you have spent it and why? You chose: Just talking to him and getting to know him as a real person.